Schools made ready for opening day. The Foster-Glocester school district acquired more classroom space in the form of three vacated buildings at the former NIKE missile base in Foster. Meanwhile construction of Smithfield’s new high school on Pleasant View Avenue was proceeding on schedule. The Family Store, once located on Route 44 in Greenville Center, advertised back to school clothes for girls. The Smithfield – Glocester League of Women Voters met at the home of Mrs. Joseph Schafer in Harmony on September15th. Their special guest was Miss Estella Vergelin, a grade school teacher from Argentina, visiting the states on a women’s leadership tour. Smithfield artist Ann Kelly won third prize at the Snug Harbor Outdoor Art Festival for her painting of Wickford Cove. The pastor of St. Michael’s Church in Georgiaville, Rev. J. Leo Lyons, was honored at the Club 44 restaurant for his thirty years as a priest. He first arrived at St. Michaels in 1935. Also at the dinner, artist drawings for the new St. Michael’s Church were unveiled, which besides the church included a school, and a convent. The new church eventually replaced the old one which stood on Homestead Avenue. On the other side of town it was announced that the St. Philip’s youth baseball team had won the New England Regional CYO intermediate league trophy. Plaid Stamps were something given out by many retailers during the1960s and 70s that could be redeemed for merchandise. One local A&P Supermarket advertisement offered a coupon for 100 extra stamps with the caption, “It’s fun getting gifts for Plaid Stamps”. The same ad offered three apple pies for a dollar – regular price, 77 cents each. Speaking of Apples, Sasso Orchards on Mann School Road offered McIntosh apples for $1.25 per half-bushel. Evidently help was needed to bring in Apple Valley’s autumn harvest based on one advertisement that read, “Apple Pickers Needed At Once, Greenville-Chepachet area. Must be able to climb trees.” Those interested were urged to apply at the Rhode Island State Employment Services Office in Providence. It’s unclear what state employment had to do with picking apples. Cal’s Jewelry & Findings Co. on Mineral Spring Avenue in North Providence was looking for “girls and women as foot press operators”. Experience wasn’t necessary. Centerdale Pontiac was offering a 1962 Pontiac Tempest for $1,195. Seven new members of the Smithfield Wing of the Civil Air Patrol were sworn in at the Esmond Recreation Center. The new recruits included Gerald Coutu, Linda Fornaro, Rosalie Varin, Gary Pfakko, Gilbert Chartier, Linda Costa-Mello, and John McGuire. It was noted that the CAP was still actively recruiting. Senator Walter Kane of Smithfield was selected as one of six Rhode Islanders to accompany Governor Chaffee to a conference in Kansas City to discuss the possibility of an education compact between all fifty states. There was a time when there were retail establishments solely dedicated selling televisions and radios. One such store which existed at 303 Putnam Pike was Charles Radio & TV. 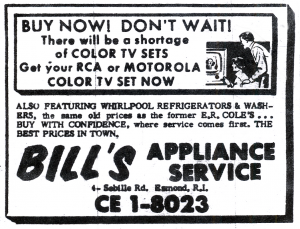 Their ad placed in a local paper in September of 1965 advertised 25” Sylvania color televisions starting at $377.97. The picture tube was guaranteed for two years, with one year of free service if anything went wrong. If the TV set happened to malfunction there was no need to bring it to the shop – they made house calls. Unfortunately, in today’s throw-away society, such businesses no longer exist.